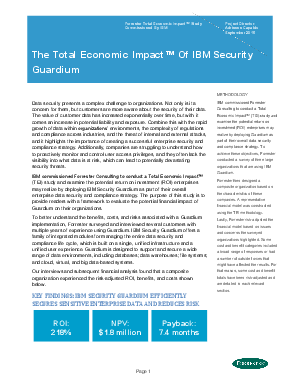 In September 2015, IBM commissioned Forrester Research consulting to conduct a Total Economic Impact (TEI) study to examine the potential return on investment (ROI) that organizations may realize by deploying IBM Security Guardium. The study uncovered that organizations achieve cost and risk reductions while increasing productivity and tactical efficiencies from implementing IBM Security Guardium. Read the study to learn more.